You are out of town and cannot pick up your voice mail. Your cell phone number was not on the dog's collar. How is someone going to contact you when they find your dog? DogID.org is an on-line database of registered dogs created for the purpose or reuniting lost dogs with their owners. 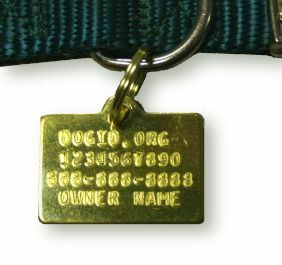 When you add your name to the database of owners you put a tag on your dog's collar with this web site address and a unique ID number. 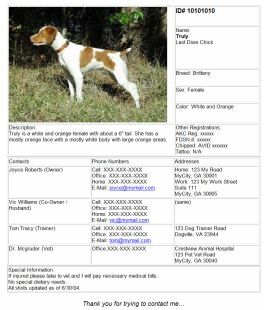 Then when your dog is found, the person can go to the web address and put in the ID number to get all of your contact information. A TOLL-FREE number is also on the tag for those people who do not have access to the Internet. Information on DogID.org can include contact names and numbers, special medical information, and even a picture of your dog for easy identification. If your dog is missing in a remote location you always have access to print out your dog's information from the Internet to create posters. For only $7.99 order a DogID Dog Collar. These very durable collars are made from urethane coated nylon. They come in bright, fade resistant, colors and do not absorb moisture or odors. We offer a collar with an "O" ring in the middle without any "D" rings. This makes it nearly impossible for the collar to catch or hang on anything and thus prevents the choking hazard the "D" ring collars have. 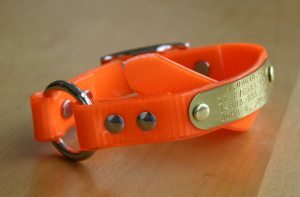 Most professionals who work with field dogs prefer and use this collar and should provide years of use with little wear, The collars come in 4 safety colors (Red, Orange, Blue, and Lime) and in five collar sizes 13", 15", 17", 19", and 21, and come in 2 widths, 3/4" for smaller dogs and 1" wide for larger dogs. Where the Toll free number will be the actual DogID.org number and the number below will be your phone number or name. Once your dog has one of these you can rest easy that you dog will be coming home. Your contact is kept confidential and only the person finding your dog will have access via your ID number. Our database cannot be "scanned" with a web browser. never loose your dog !!! Go back to our MAIN PAGE and enter a dog number 10101010.